A day of two parts. First we have some very serious climbing to reach the top of the massive Ardèche gorge and then follow its rim. Then it is downhill to reach and traverse the Rhône flood plain, cross the river and navigation and head for higher land and Vaison la Romaine. No real time for a warm up before we engage low gear and embark on the double arrow steep climb out of the gorge. Find a steady pace and settle in for the climb. On our approach to a tunnel John spots a pair of horns poking above the verge side, shortly followed by a head and then a complete adult goat plus baby. They saunter across the road in front of us and scramble up the near vertical cliff opposite (as goats do). At the top we stop at the balcony du Serre de Tourre and get off to peer down at the river in the gorge far below. We make our way from balcony / belvedere to balcony / belvedere along the top of the gorge, stopping at each to enjoy the dramatic views It is a very up and down ride and we have to pull away to go into and over side gorges. The belvederes have all been redone with new paving and railings since we were last here. This has been very well done to cater for tourists while still looking good. The roadside at various points has been covered in large rocks. We presume these are intended to be an unobtrusive but very effective way of preventing parking or casual overnight stops by camper vans. It is quite early so there are not too many tourist cars on the road, but we still seem to be as much photographed as the views of the Ardèche gorge. Sheila is concerned that all the stops mean we have spent most of the morning only to travel 30km, but John is not too bothered. This is the tough cycling part of the day with all the viewpoints and we will make faster progress later. 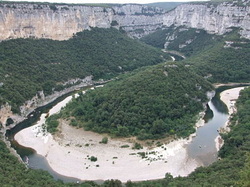 Finally and speedily we drop back down to river level as the gorge ends and we roll into St Martin d’Ardèche. We stop at a seat by the riverside and Sheila goes in search of elevenses and lunch. She returns with formula picnic lunches. These include framboise tarts that require immediate eating. We depart across the river over the long suspension bridge that has a single track for pedestrians and vehicles and is traffic light controlled. From here it is an easy roll down to and across the Rhône flood plain so we bowl along easily at a good pace to reach Pont St Esprit where we take the long bridges crossing the river then in a few kms the navigation. There is a constant procession of heavy aggregate lorries thundering past us along here, but luckily not too far on we come to the point where our route has a heavy vehicle ban and they all go off in another direction. In Mondragon we have a moment of navigation uncertainty, but work out that we need to cross the railway by a short gravel track under a very low bridge in order to get away on the correct road. Time to start climbing again as we wind our way up into more hilly countryside. On the outskirts of Mondragon there are quite a few new houses scattered around and it is obvious that we are in the land of the Romans as they often sport the odd column or pseudo portico. In fact in this part of Provence even the bus shelters look like miniature Roman villas and must have been expensive to construct. We see picnic benches in a shady and grassy spot away from the road, so pull off onto the verge and walk down to have our sandwich lunch. From here we continue over the tops with quite a few ups. In St Cecile we do a circuit of the town in search of a café, finally spotting one reached via a multi-way temporary traffic light system and road works. We settle down for SdM&C. From here we drop down to cross the River Aigues and, of course, climb again on the other side to reach Cairanne. A short distance on in Rasteau we are temporarily defeated by the one-way system and end up climbing to the château to find ourselves at a dead-end in its courtyard. At the second attempt we are successfully back on route and dropping down to the Ouvèze valley, which takes us to Vaison la Romaine. As we approach the town we find ourselves on wet roads so we have timed it well to arrive just after the rain has gone through. Vaison la Romaine is a large and busy place and the final couple of kms are not too pleasant on a busy main urban road with rather unforgiving traffic and lots of traffic signalled junctions. However, the GPS track does its stuff and delivers us accurately to the front door of our B&B. A daughter of the house answers the front door – her parents are out. There does not seem to be any record of our room booking so Sheila produces a copy of the e-mail booking confirmation. No matter, there is a room available. We carry the trike through the gate and park it in the front garden. S&W then flop on the bed to watch the end of today’s TdF stage on the television. An unsuccessful and not happy fifth placed Mark Cavendish. Later we walk down into the historic town centre, which is not too far from B&B. The name la Romaine is well-justified – large areas of Roman remains all around, including a Roman bridge, which, justifiably for its age, looks well battered. Across the river, medieval Vaison is well preserved with interesting narrow streets and is almost totally free from shops, restaurants or other commercial uses. These are all on the other, Roman, side of the river in the present day town centre. We go easy on the walking tour because John’s knee is still a bit poorly and return across the river. Back in the town centre we select a restaurant for a pasta supper facing a large, newly done-up square. Just like almost everywhere we have been in France the paving of the square has been well done and interesting new fountains or rills have been included. If only there was half the initiative back home for Lymington High Street. Interestingly the new seating in the square is individual comfy and quite sculptural chairs fixed to the ground but informally scattered around and grouped in pairs or small clusters. Not a sign of graffiti anywhere.